Announced on September 25th, 2013, the newest tablets Kindle Fire HDX from Amazon come with some impressive new screens and internals that should bring equally impressive performance to users. Some peole believe that Amazon's Kindle Fire HDX tablets pose real threat to iPad dominance due to the attractive features. Major upgrades from last year's models, the 7-inch and 8.9-inch HDX models have the highest-resolution screens currently on the market, and the fastest chips ever put in tablets. Kindle Fire HDX has a high resolution display (1920x1200) and high pixel density (323 ppi) for an incredible multimedia experience. The display features over 2 million pixels for vivid, lifelike images that go beyond standard HD. New Origami-style covers will be available for each tablet; they can be configured to stand the tablets up in portrait or landscape orientations. The Origami cover is available in eight different color options, and in both leather and polyurethane — that folds up in a unique way to serve as a stable dual-position stand. Mayday service is built-in and nearly immediate tech support like we've never seen before. After tapping the Mayday button on the screen, a live tech support representative will appear on your screen within 15 seconds. Meanwhile, you can also operate on your Kindle Fire HDXs. The rep can draw on the screen, take complete control of your tablet, or simply coach you through difficult times. All problems can be resolved on the tablets without endless repeated but inefficient telephone customer service. 4. All-New Fire OS "Mojito"
The new Fire OS 3.0 "Mojito" starts with Android 4.2.2 which adds cloud services, a content-forward user interface, built-in media libraries, productivity apps, and low-level platform enhancements to integrate Amazon's digital content and improve performance for Kindle Fire tablets. For dedicated reading, you might prefer a lighter e-reader. Kindle Fire HDX is lighter than its previous generations which makes it more portable. How to read ebooks on Kindle Fire HDX? Amazon has always been devoting to creating excellent reading experience for its users. 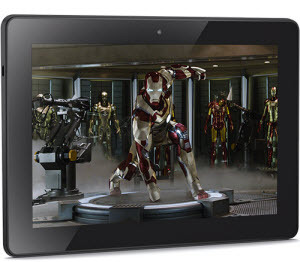 How about the new coming Kindle Fire HDX tablets? "We make money when people use our devices, not when they buy our devices," CEO Bezos said during an in-person product briefing where he showed off the two new tablets. Now it seems to be true when comes to reading ebooks on the device. Kindle Store provides millions of books, newspapers, and magazines. 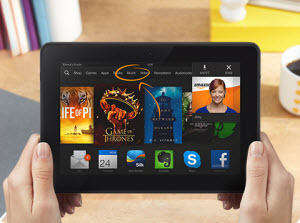 You can shop in the store and enjoy reading on your Kindle Fire HDX tablets. Amazon Prime provides various preferential treatments for Prime users. For example, unlimited instant streaming of thousands of movies and TV shows with Prime Instant Video, free Two-Day Shipping on millions of items and so on. For reading ebooks, Kindle owners can borrow any title from the Kindle Owners' Lending Library for free, as frequently as a book a month, with no waiting and no due dates. Audible is another expectation as it can read eBooks for you at times, while cooking or working out, when you can listen but can't read. Audible offers tens of thousands of titles, including best sellers, romances, thrillers and much more. Every book is read by a professional narrator. Overview: Amazon is making key improvements with Kindle Fire HDX. For people who use Amazon a lot for books, video and other services, the Kindle Fire HDX delivers incredible value for its price.